Ella + Elliot (Queen W. & Strachan Rd.) must be the trendiest baby/kid store I’ve been to in this city! It might be worth checking out this sale if you are looking for furniture and other items. Does your baby love playing or devouring your cell phone? I have to admit that there have been times (mostly in long line-ups) that I have voluntarily handed my cell phone to my daughter to avoid an eruption of toddler impatience. I am not proud of such moments especially because I worry about radiation. I came upon this informative website about cell phone radiation where you can look up your cell phone and learn how to reduce exposure. Join a sleepover @ The ROM (5yrs.+). These fun sleepovers will take place one Friday a month from this weekend until the end of the school year. Enjoy a backstage pass to the galleries, a special movie screening, speak with the experts and make a souvenir to take home. Let’s not forget PJ karaoke and a midnight snack before bunking down. For program details, visit the sleepover registration page. Groups welcome. Adult accompaniment required. Go to the Farmer’s Market at Artscape Wychwood Barns (near St. Clair & Bathurst), Sat. 8am-12pm. I have heard a lot about Wychwood Barns and hope to check the place out this weekend. The barn was originally a repair shop for streetcars for the TTC. The land and buildings were recently re-purposed into an arts centre for artists, environmental organizations, workshops and events. I hear that the outdoor playground there is awesome and that the kids will have a great time! Sing & Dance with Jack Grunsky @ Solar Stage Children’s Theatre (Yonge & Sheppard, Oct. 4th, ages 3-8). Jack Grunsky is an award-winning Canadian musical performer who has entertained kids for years! Enjoy his upbeat and interactive performace this weekend but act quickly because the show is almost sold out. Have fun at the 165th Markham Fair (Markham Fairgrounds). Everything from meeting Dora to seeing the Monster Truck madness. There are too many activities to mention so check the website! Sophie the Giraffe is the best chew toy for teething babies. I swear. It’s non-toxic, easy to hold and babies just love it! However, it’s a bit more pricey than other chew toys ($20) which makes it that much more annoying when your baby drops it from his/her stroller and it vanishes. Luckily, a clever B.C. mom has designed the Sophie Saver. The Sophie Saver is a strap that attaches to a stroller or car seat on one end and to Sophie (or another toy) on the other end. $8 @ Sophiebelle’s shop on Etsy. Moms are just full of ideas…and some of them carry through. Straws & Connectors is my favourite construction toy for kids 4+ and makes for a great birthday gift (only $16.95 @ Mastermind). The building set was a hit in my Gr. 3 classroom…the kids just loved building structures and multiple kits allowed them to build large forts. I love to get this toy for girls because there aren’t many construction toys out there that don’t have BOY written all over them. The set comes with 230 straws and 100 connectors and hours of busy-busy. It’s one of my favourites because it is so simple and really allows kids to use their imagination. If you have a baby at home, this might not be ideal for your household because the connectors are a choking hazard and they do get everywhere. Straws & Connectors is my favourite construction toy for kids 4+ and makes for a great birthday gift (only $16.95 @ Mastermind). The building set was a hit in my Gr. 3 classroom…the kids just loved building structures and multiple kits allowed them to even build large forts. I love to get this toy for girls because there aren’t many construction toys out there that don’t have BOY written all over them. The set comes with 230 straws and 100 connectors and hours of busy-busy. It’s one of my favourites because it is so simple and really allows kids to use their imagination. If you have a baby at home, this might not be ideal for your household because the connectors are a choking hazard and they do get everywhere. Join a sleepover @ The ROM (5 yrs.+ with adult). These fun sleepovers will take place one Friday a month from this weekend until the end of the school year. Enjoy a backstage pass to the galleries, a special movie screening, speak with the experts and make a souvenir to take home. Let’s not forget PJ karaoke and a midnight snack before bunking down. For program details, visit the sleepover registration page. Groups welcome. Sing & dance with Jack Grunsky @ Solar Stage Children’s Theatre (Yonge & Sheppard, Oct. 4th, ages 3-8). Jack Grunsky is an award-winning Canadian musical performer. Enjoy his upbeat and interactive performance this weekend but act quickly because the show is almost sold out. The catch is that you have to spend $100…but that’s not very difficult. Winners is always full of fantastic surprises. Melissa & Doug toys sell for a fraction of the price and their selection of bedding for babies and kids just keeps getting better. Winners also has a pretty good selection of costumes for Halloween at great prices. If only the line-ups at the cash registers weren’t always so loooooooong… On the bright side, it’s during those lengthy line-ups that I re-think the contents of my cart and get rid of some items that I really don’t need. Coupon valid until Oct. 20th. 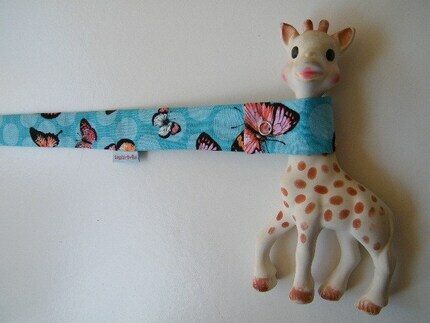 Sophie the Giraffe is the best chew toy for teething babies. I swear. It’s non-toxic, easy to hold and babies just love it! However, it’s a bit more pricey than other chew toys ($20) which makes it that much more annoying when your baby drops it from his/her stroller and it vanishes. Luckily, a clever B.C. mom designs and sells the Sophie Saver. The Sophie Saver is a strap that attaches to a stroller or car seat on one end and to Sophie (or another toy) on the other end. $8 @ Sophiebelle’s shop on Etsy. Moms are just full of ideas…and some of them carry through.you can also order online or see their booth at the upcoming One of a Kind Show. There are so many wonderful farms with apple orchards in Ontario and now is the time to take the kids apple-picking! If you are sick of Chudleigh’s (like me), and want to find something a bit less busy, check out this website for a directory of great apple-picking spots. We personally like Applewood Farms. Have I talked about the Shops At Donmills enough yet? This weekend (July 25th + 26th), the Town Square transforms into a play zone with a bouncing castle and obstacle course. The wonderful water fountain has turned into a great splash area for kids and it’s so much fun! Bring towels and a change of clothes. Last weekend, I breathed at Anthropologie while my husband watched The Boy splash around (on a chair in the shade, mind you). A win-win! Family fun takes place 12pm-4pm on Saturday and Sunday. The Shops At Donmills has great family bathrooms located right next to the water fountain and Guest Services will happily warm up a baby bottle for you or provide an emergency diapering kit for $2. 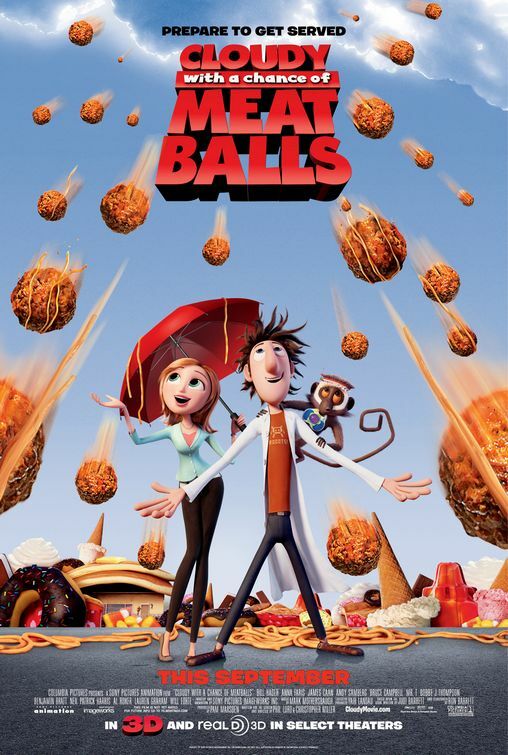 …and, come out on Saturday night for a movie on the lawn @ The Town Square. The Princess Bride is a great family movie to enjoy together. Bring blankets and lawn chairs. The movie begins at dusk. How fun! Posted in Ideas, Useful Info. Posted in Activities & Events, Useful Info. If you have a season pass, you can bring a friend…someone like me who doesn’t have a pass! This weekend (Sat. 26th+Sun. 27th) only. Purchase Bring-A-Friend Tickets here. Posted in Activities & Events, Deals, This Weekend. I love the Britax brand of car seats because of their top safety ratings and the child’s comfort in the seat. I measure a child’s comfort by how far their head dangles down when they fall asleep in the car. Have you ever spent an hour in the front passenger seat but with your hand holding up your sleeping toddler’s head in the back seat? Not so great. With the Britax Roundabout or Marathon, you will never have to do that…I promise. Dearborn Baby (near Yonge & Steeles) is having a one-day Britax Car Seat Sale on Saturday, Sept. 26th. Savings range between $20-70 depending on the seat. St. John’s Ambulance car seat installers will be on site to professionally install your seat for an additional $20. The Ontario Science Centre is celebrating its 40th birthday on Saturday, Sept. 26th and you are invited! Enjoy free admission, free showings of the IMAX film North of Superior, hamburgers, hotdogs and juice price under a dollar, birthday cupcakes and more. Springridge Farm’s Harvest Festival (Milton) begins this weekend. There is a 5 Acre Corn Trail Maze, professional puppet shows, wagon rides, dace painting, fun farm yard with sandbox, barn, etc.). Admission to Harvest Festival: $8 for 2 years of age and old. Come to Queen’s Park on Sunday, Sept. 27th for Canada’s largest book & magazine festival, The Word on the Street. There will be a marketplace as well as featured authors, poets and storytellers. Visit the children’s area wich includes reading and activity tents for children 0-11yrs as well as a marketplace for children’s literature. Sounds like an amazing way to celebrate reading with your kids! Visit the Kortright Centre for their Green Home Show and learn about sustainable energy and green building solutions through tours, workshops and demonstrations. Whittamore Farm’s Pumpkinland (Steeles & Markham Rd.) is already open! Aside from the usual fun at this farm, from now until Oct. 31st, you and your family will also enjoy choosingpumpkins, wagon rides through the haunted forest and best of all, Farmer Frank shoots and catapults pumpkins to unbelievable lengths at the Pumpkin Cannon Show which runs several times each weekend day. We saw this show last year and it was so much fun…but it was cold so I would recommend enjoying Pumpkinland while the weather is still nice and warm. Markham Museum (North of Hwy. 7) is hosting an Apple Festival. Enjoy a sample from the apple cider mill, activities for kids, museum wagon rides, heritage apple orchard, steam tractor and little train. If you enjoy art festivals as much as I do, join the St. Claire Festival & Studio Tour (St. Claire Ave. W, Bathurst to Oakwood). There will be activities for kids…but I am not sure what those include! Last week I was on a mission to find a toddler blanket. The girl is now 2-years-old and still in a crib. A baby blanket is too small and a twin size blanket is way too big! I searched high and low and couldn’t find anything other than some crazy-priced quilts. Luckily, I found what I was looking for at the Thornhill Mompreneur Night last Thursday. It was kismet! Create-A-Dream is a company run by a lovely mom who designs a unique, high-end line of children and baby bedding. The designs are whimsical and original and you can mix and match patterns. Everything is printed with Okotex certification (meaning that the bedding does not contain any harmful dyes or chemicals) on the finest of fabrics. You can purchase a complete set or choose an item to complement what you already have. Come to Queen’s Park on Sunday, Sept. 27th for Canada’s largest book & magazine festival, The Word on the Street. There will be a marketplace as well as featured authors, poets and storytellers. Visit the children’s area wich includes reading and activity tents for children 0-11yrs as well as a marketplace for children’s literature. Sounds like an amazing way to celebrate reading withyour kids! Nothing can make me happier these days. That’s a little troubling, I know…. Walmart’s 15th Anniversary Sale includes the huge boxes of pampers (100+ diapers, depending on size) for $26.97 (down from $37)! Sale ends on Oct. 2nd. Although The Girl might be toilet-trained by the time we get to the fourth box, I figure that I can always use the 90 day return policy. Halloween is coming up and I am going to try to bring you some creative do-it-yourself costume ideas. This adorable Lego costume is from Country Living and comes with complete instructions. For more ideas, see the Holiday Goods category on www.mamapicks.com. My best find from the recent Cabbagetown Arts & Crafts Fair was Alphabet Photography. Inspired by the book Alphabet City, photographer Jennifer Blakeley spent 3 years traveling North America in a quest to complete her extensive portfolio of everyday objects that resemble letters of the alphabet. You can purchase any set of letters to make up any word or name. I bought my son the letters of his name and he was fascinated! This gift can become a timeless part of any child’s room but is even more suitable for adults (i.e. the words love or family in a family room would look classy). The studio is located in Niagara Falls but you can also order online or see their booth at the upcoming One of a Kind Show. $15 personalized bags from KidSpot: Offer ends on Sept. 30th. Pinkalicious Ticket Giveaway winner announced! Great Deals @ Toys R Us this week! 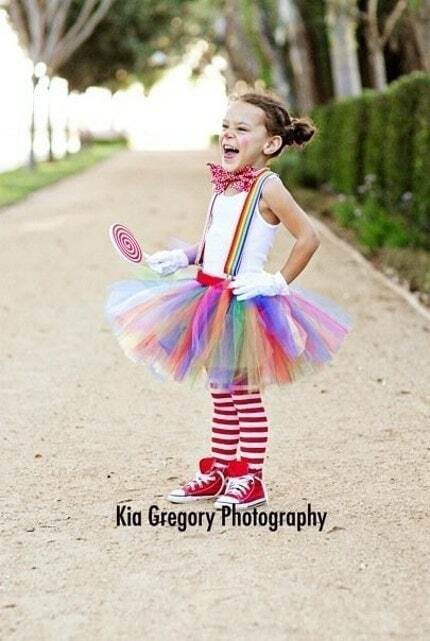 It’s all about the tutus for this Halloween! Check out this adorable clown costume 🙂 You can be creative and put it together yourself, or buy it on Etsy from Lulabugs1 Shop for $40US. Posted in Cool Products, Holiday Goods, Ideas. 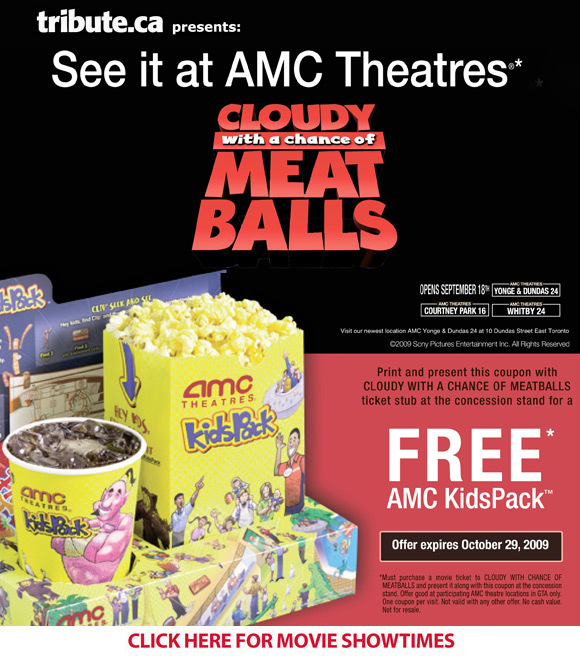 See Cloudy with a Chance of Meatballs at any AMC Theatre and receive a free kid’s pack with this coupon! Expires October 29th, 2009. Halloween is coming up and I am going to try to bring you some creative do-it-yourself costume ideas. This adorable Lego costume is from Country Living and comes with complete instructions. Create-A-Dream Bedding – A Mamapicks Exclusive Discount! If you need a gift for Rosh Hashanah, new baby or are looking for something special for your own child, contact Create-A-Dream at orit @ create – a – dream . com. The service is very quick! Special prices are not available on the website. Posted in Cool Products, Deals, Decor, Exclusive Discounts. Pinkalicious is a wonderful off-Broadway musical, opening in Toronto on October 10th! The play is based on the popular children’s book “Pinkalicious” by Elizabeth & Victoria Kann, about a girl who just can’t stop eating pink cupcakes and ends up at the doctor’s office with Pinkititis. At first, turning pink from head to toe seems like a great thing but soon, Pinkalicious has to find a way to get out of this predicament! This fun musical will run at the Richmond Hill Centre for the Performing Arts from October 10th – March 21st, 2010. There will also be a performance on Thanksgiving Day and Family Day. Check here for tickets and show times. I think this is a great way to introduce your child to live theatre! The play is suitable for ages 2-10. Pinkalicious is offering Mamapicks readers a chance to win a pair of tickets to see the play! We are so excited 🙂 The 10th person to answer this question will be the lucky winner. E-mail me to let me know in what other big city Pinkalicious is currently playing. Posted in Activities & Events, Contests & Giveaways.